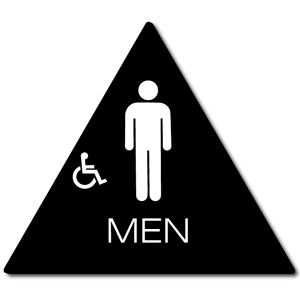 An ADA-compliant California DOOR sign made from durable, vandal-proof, high-impact CAD-cut acrylic. Sign size: 12 inch triangle x 1/4 inches thick. This is a DOOR SIGN for California Title 24 VISUAL requirements. This sign is mounted to the door. The color of the sign must contrast with the color of door. Per California Title 24, raised tactile lettering, symbols and braille are not required nor prohibited on these door signs. 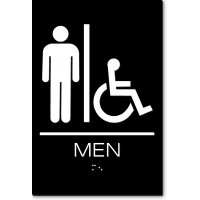 To fully comply, the WALL SIGN shown below as a Related Product must also be installed to meet State of California ADA requirements.